Celebrating 45 years in business, Main Opel Dealer JJ Fleming & Co (JJ Fleming Opel) is a one-stop shop for all your new and used passenger and commercial vehicle sales, vehicle testing, servicing, parts, accessories and finance needs. 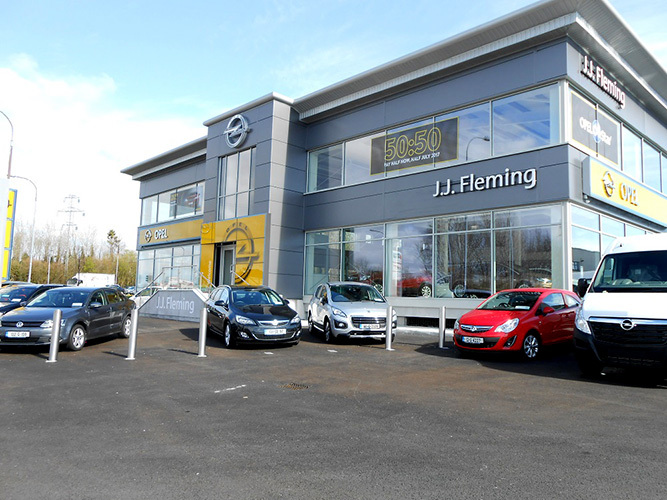 Situated on the Tuam Road in Galway, JJ Fleming & Co is one of the longest-established and best-known Opel dealerships in the country. Found in 1972 by JJ and Mary Fleming, the dealership was originally based in Clonfad, Co. Roscommon before relocating to Galway a few years later. JJ and Mary’s son Pat is the current Managing Director of the company which employs over 20 staff. JJ Fleming & Co prides itself on delivering a personal, friendly, cost-effective and efficient service to its ever-growing customer-base. As well as its new Opel range of cars and commercial vehicles, the company offers a huge range of quality used cars and also operates one of the busiest CVRT test Centres in the West. Opening hours are from 9am to 6pm Monday to Friday, and from 9am to 5pm on Saturdays. The CVRT Centre (then DOE) first opened in 1980 when Light Commercials (LCVs) and Heavy Commercial Vehicles (HCVs) were both tested. For the past decade, however, JJ Fleming & Co has been testing LGVs only. These include light commercials, 4x4s and camper vans weighing under 3,500 kg (3.5 tonnes). JJ Fleming & Co is part of a network of independently-owned CVRT Centres dotted across the country which carry out inspections on behalf of the RSA on LCVs. The annual CVRT inspection includes checking brakes, lights, markings, wheels and tyres, steering and suspension, chassis and underbody, exhaust emissions, electrical systems, glass, mirrors and more. The family-run business has invested heavily in the latest diagnostic equipment for testing all LCVs. The purpose of the test is to ensure that the vehicles satisfy basic safety standards and are in good condition throughout their entire life. A full test (inclusive of VAT) for a light commercial or 4x4 is €111.16, while it’s €93.16 for a camper van. Bookings can be made over the phone or online. “We have made a significant investment in providing the best facilities for our customers. Their safety on the road and the safety of others is paramount to us,”CVRT Centre Supervisor / Service Advisor Mike Gannon says. “We have one test bay and three qualified testers, including one full-time, who have a wealth of experience in commercial vehicles. They are more than happy to answer any questions you may have before or after the test. We will always try to accommodate our customers at a time that suits them. They can relax in the waiting area, which is located in our new state-of-the-art showroom, while the test is being completed. We have coffee-making facilities, free WIFI and even a monitor which shows the test being carried out, to pass the time for them. Customers have the option of having repairs carried out on their vehicle on the day of the test, which saves them another trip to the garage. While JJ Fleming & Co’s parts department specialises in genuine Opel parts and accessories, it can source same for any make or model within 24 hours. The new showroom has the distinction of being the largest of any Opel dealership in the country. Opened in 2014, it hosts the complete range of Opel cars and commercials, including the all New Insignia and Crossland X models as well as the ever-popular Astra Hatchback, which was European Car of the Year for 2016, the smaller Corsa and the Mokka SUV. A top-class sales team is on hand to help you choose the perfect car / commercial for you. The new Insignia and Crossland X made their respective Irish premieres at JJ Fleming & Co on May 27 and June 3 last. Hailed as the executive car that’s a class above the rest, sculptural artistry, German precision and premium-class innovations make the new Insignia the epitome of a statement car. The Crossland X, meanwhile, is the latest addition to the Opel SUV family. It features a host of class-leading technologies, superior connectivity and innovations which are perfectly tailored to the modern Irish lifestyles. “There were queues of people waiting to test-drive the new Insignia which is a good sign,”JJ Fleming & Co car sales manager Brendan Garvey says at the launch. Opel also offers a great range of commercials in the Corsa van, Combo, Vivaro and Movano. At the time of writing, JJ Fleming & Co was offering 15 per cent off the price of a new Vivaro, which is Opel’s mid-size van. “That offer has been very successful for us. The beauty of having such a large showroom is that we can offer the same experience to all customers, whether they’re buying a van or a car. Brendan Glennon is our commercial sales manager and would be happy to assist you with any queries you may have,”Brendan explains. JJ Fleming & Co also stocks a huge selection of quality used cars which can be viewed at its new purpose-built display area. “We provide great offers on new and used vehicles, servicing, parts, accessories and finance,”Brendan continues. Be sure to get down to JJ Fleming & Co on the Tuam Road to check out the widest range of new and used passenger and commercial vehicles in the West.